The instruments described on this website are ones I have made myself. 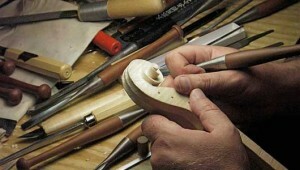 I make violins for professional players and serious students who are approaching professional level. I have made over 150 instruments, many of which are being played in Europe and Asia as well as throughout the U.S. Below you will find basic information about my instruments and how they are made. Photographs of some of my instruments can be viewed in the Instrument Gallery section of this site. The best-known makers of the past have been consistent in using a single model for years at a time, achieving perfection through repetition, and I have taken this point to heart in my own choice of models. The golden period Antonio Stradivari and the late Joseph Guarneri del Gesu violins are universally acknowledged by contemporary players as the most functional violins ever made. The two makers’ models are very different from each other in concept and in performance, and players tend to prefer one over the other, depending on their style of playing. Therefore, I make one model of each. 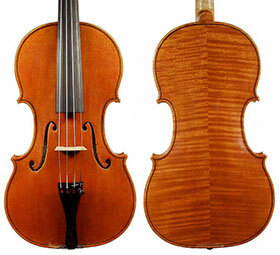 For my Stradivari example I have chosen the ex-Baron Knoop of 1715. Baron Knoop was an important violin collector of the 19th century and amassed a collection of the best examples of many makers. 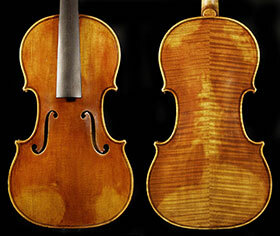 I chose this example because of its flawless condition, its stellar reputation, and its adherence to the principles that Stradivari developed in his Golden Period, which is usually considered to have peaked in 1715. This model is bright, responsive, and easily accessible, appreciated by jobbing pros who play for hours at a time and by advanced students. Of the late period del Gesu violins, one violin emerges as unquestionably the most famous—the ex-Paganini “Cannone” of 1743. Most of the contemporary makers who have taken this famous instrument as their model can work only from published pictures and drawings of it, but I was fortunate enough to examine this instrument in conjunction with photographing it during the 1995 Paganini Competition in Genoa. My impressions of this fabulous instrument remain vivid, and there was no question that it would become the inspiration for my del Gesu model. This model offers a very broad tonal palette and wide range of response, but is more difficult to play and requires more force to achieve the same penetration as the Stradivari model. In making both of these models I adhere carefully to the details of arching and graduation of the originals, rather than using the generic measurements that are often taught in violin making schools, or theoretical constructs of an “ideal” violin from modern acoustical studies. Therefore, my two models differ greatly from each other in tone and appearance, and correspond more closely to the original two examples than one might usually expect of new violins. I welcome private correspondence on these issues from players who are considering the purchase of one of my violins, and who wish to find an appropriate fit for their own style of playing. 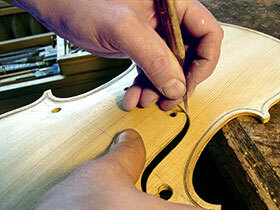 For violin makers, there are few options available in the choice of materials. Because I am a traditional maker, working on historic models, using hand tools and older methods, I use only traditional materials. The wood in my instruments comes from the same parts of Europe as the original Cremonese makers’ wood is believed to have come. I select and prepare the wood for maximum stability, resulting in instruments that remain relatively unchanged through the seasons and usually require a minimum of maintenance. I have tried using many different American woods of species similar to the traditional European woods but have found them lacking in some very specific and disturbing ways. American spruces, in particular, often offer more power, but with a corresponding lack of sophistication of tonal quality discernible to better players. In my experience, this deficit is difficult or impossible to overcome by modifying construction techniques. 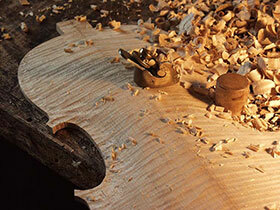 Therefore, I no longer use American woods in my work, except in tonally insignificant areas. I dye and make my own purfling rather than purchase it ready-made. I also mix my own varnish from materials that would have been available in 1700, using a formula that I researched and developed. The resulting varnish exhibits characteristics as close as possible to those I have observed on hundreds of Cremonese instruments. My attitude about shop techniques might surprise those who know me as a huge proponent of technology when it comes to other areas (such as computers, photography, and so forth). In violin construction, my one concession to modern times is the use of some power tools, since I don’t have a shop full of apprentices to do the heavy sawing for me. Otherwise, I adhere to methods similar to those of 300 to 400 years ago. Modern acoustical science has an appealing glow about it, but as a maker trying to replicate the effects and sounds of an instrument designed 450 years ago and perfected nearly 300 ago, I believe that the methods used by those makers are essential to achieving the same results they achieved then. I rely on principles I have learned from first-hand, in-depth examination of over 100 Stradivari instruments and 40 del Gesu violins, either intact or apart for restoration. There are certain ways in which I follow modern practice, in keeping with changes that occurred gradually in violin playing between about 1780 and 1820. These necessitate a different approach to the neck and its fitting to the body, and to the overall setup of the instrument. For the remainder of the instrument, I work on traditional forms, modeled on those still extant from the shop of Antonio Stradivari, and use the traditional templates and tools of a 17th century violin maker. As much as possible, I attempt to make an instrument that when new looks just as the musician of 1715 or 1743 would have seen it—with no antiquing, and with the textures new violins of that period would have had, rather than the more contemporary featureless finish we are accustomed to seeing on modern commercial products such as factory violins.